In a small pan, bring the coconut milk to a simmer, then remove from heat. Make sure the coconut milk is just barely at a simmer when you remove it from heat, if it is boiling it can burn and ruin the chocolate. Add the chocolate, butter, and salt to a medium-sized bowl, and pour over the warmed coconut milk. Whisk the mixture until smooth. Refrigerate the mixture for at least four hours to harden. 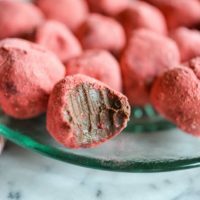 Once hardened, use a tablespoon to scoop the mixture into a ball and roll in the strawberry powder. If your chocolate seizes, you can microwave it on low power (or defrost setting) in 15 second intervals, stirring each time, until it comes back to temperature.